Kadidiatou Diani celebrates scoring one of her two goals in France's 3-1 win over the United States women's national soccer team in Le Havre. When U.S. women’s soccer team coach Jill Ellis planned a winter trip to Europe for her program, she wanted her players to get a real test from life and games abroad. They got one and then some on Saturday. 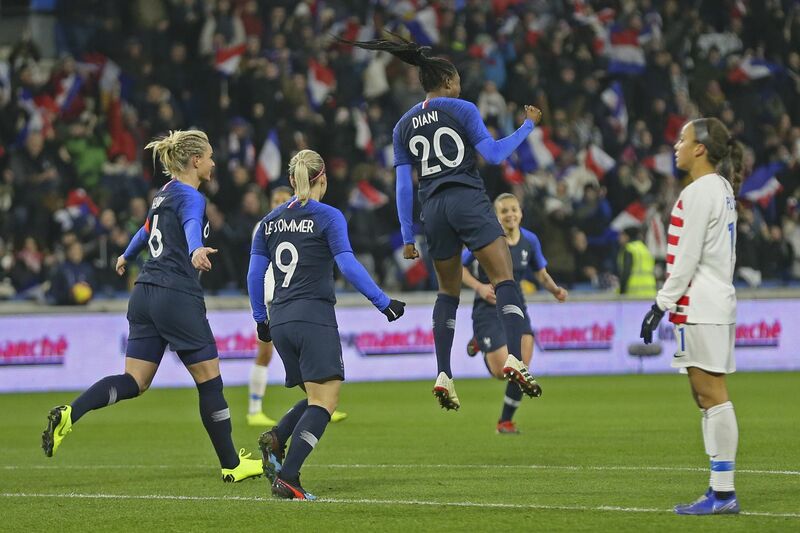 France, their fellow women’s soccer superpower that will host this summer’s World Cup, gave the Americans a thorough 3-1 beating at Stade Océane in Le Havre. The result ended the Americans' 28-game undefeated streak that dated back to July 27, 2017. It was also the third straight game between the two nations that the U.S. did not win: they drew 1-1 last March, and France won 3-0 in March of 2017. As would be expected from a game of this magnitude, there were subplots even before kickoff. U.S. coach Jill Ellis held star midfielders Tobin Heath, Megan Rapinoe and Julie Ertz out of the game entirely because of minor injuries. The same went for reserve outside back Casey Short. Starting right back Kelley O’Hara also was out as she finishes recovering from ankle surgery in late October. That gave starting opportunities to forward Christen Press, winger Mallory Pugh, midfielder Morgan Brian and defender Emily Sonnett. Crystal Dunn, often deployed as a left back, played the attacking midfield role she holds for the NWSL champion North Carolina Courage. Emily Fox, a University of North Carolina sophomore brought up from the U.S. under-20 team, started at left back. France, meanwhile, rolled out all of its stars: towering centerback Wendie Renard, midfield stalwart Amandine Henry, and creators Gaëtane Thiney and Eugénie Le Sommer. With a sellout crowd at one of this summer’s World Cup venues looking on, France went at the U.S. right from the start. Les Bleues focused on Fox in particular, hoping to exploit the 20-year-old’s inexperience. That plan produced a goal within 10 minutes of kickoff. Delphine Cascarino beat Fox one-on-one on the flank, then squared a pass for Kadidatou Diani in the middle of the 18-yard box. She shook off Abby Dahlkemper with a sharp turn and fired a low shot past U.S. goalkeeper Alyssa Naeher. Ellis stayed with her starters into the second half, a somewhat surprising move given how badly Fox was overmatched. Fox was withdrawn in the 53rd minute, but the move produced another surprise. Centerback Tierna Davidson, the Stanford phenom headed to the Chicago Red Stars as the No. 1 pick in this year’s NWSL draft, replaced Fox and took over at left back. Four minutes later, Diani scored again, launching a beautiful chip from the right side of the 18-yard box that flew over an outstretched Naher. Dahlkemper didn’t look good there either: she was tracking Diani but seemed to hesitate for a moment when Diani got the ball. That was more than enough of an invitation for Diani, who has 10 goals in 18 games for Paris Saint-Germain this season. Carli Lloyd replaced Sonnett in the 71st minute as the U.S. moved from its usual 4-3-3 formation to a 3-4-3. It didn’t help, though, as France got its third goal in the 78th. Elise Bussaglia fired a long pass that split Dahlkemper and Becky Sauerbrunn, and Marie-Antoinette Katoto raced through the gap to the ball. Katoto kept right on going, rounded Naeher and finessed the ball into the empty net. Katoto is the French league’s top scorer this season, with 17 goals in 14 games — plus five in four Champions League contests. Add her to the list of names to watch for the home team at the World Cup. The game was long since decided when Ellis brought in midfielder Sam Mewis, who set up Mallory Pugh’s 91st-minute consolation goal; and forward Jessica McDonald. They replaced Lindsey and Alex Morgan, respectively. Had Mewis come in sooner, she could have made an even bigger difference. As headline-grabbing as the result was, the Americans' absences must give the day an asterisk. France might not have overloaded Fox’s flank had Rapinoe also been on that side of the field, helping on defense and affecting the tempo on offense. Heath’s possession skills were sorely missed, and Ertz’s steel in central midfield might have been missed most of all. These two teams have been playing a mental chess game against each other for years now, waiting for a clash in a major tournament that could define this era of global women’s soccer. It might come this summer. If both teams win their groups and their round of 16 games, they’ll meet in Paris in the World Cup quarterfinals. Barring injuries, both teams will surely be at full strength then. We’ll see if that result is different from this one. And by the way, the U.S. lost at France in early 2015, too. A few months later, they won the World Cup.